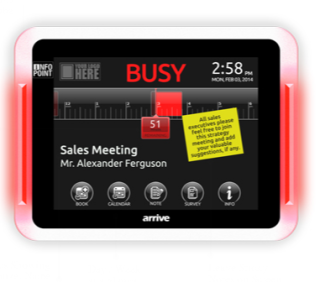 Liberty AV Solutions has formed an agreement with Arrive Systems, Inc., which provides Liberty’s extensive channel network in the Pro-AV markets the ability to source and support Arrive Edgeless Media Platform products and solutions across North America. Liberty will extend its current range of audio-visual integration products to offer enterprise class Edgeless Media solutions with Arrive InfoPoint room signs, Arrive FacePoint extreme collaboration room systems, and Arrive ViewPoint rich media lecture recording systems ideally suited for enterprise and education markets. Arrive Edgeless Media is a unified platform that develops and offers a large range of convergent Unified Collaboration & Pro-AV Room Systems as a single vendor, which includes an extensive range of unified software and hardware systems comprised of interactive flat panel displays, cameras, microphones, codec appliances and unified AV controls systems with wireless BYOD and Cloud connectivity. Arrive’s Edgeless Media Server Platform provides integration with Microsoft Lync collaboration platform and OpenCast Matterhorn Open Source Lecture Capture & Video Management for Education. “Arrive is building technologies and bringing edgeless media solutions to market in the sunrise of extreme collaboration. This is an exciting technology space where we can see transformation everywhere. Collaboration is happening all around us and we are extremely excited to partner with Liberty AV which significantly enhances the potential and brings new opportunities in collaboration and rich media to Liberty’s customers and channels," said Lee Dodson, president of Arrive Systems, Inc.